Athens is known for historic sites, museums, nightlife, shopping, and fun & games. Your plan includes some of its best attractions: delve into the distant past at Acropolis of Athens, explore and take pictures at Panathenaic Stadium, see the interesting displays at Museum of Pavlos and Alexandra Kanellopoulos, and appreciate the history behind Temple of Olympian Zeus. For photos, more things to do, ratings, and tourist information, go to the Athens day trip planning website . Durham, USA to Athens is an approximately 16-hour flight. You can also do a combination of train and flight; or do a combination of flight and bus. Traveling from Durham to Athens, you'll lose 7 hours due to the time zone difference. Traveling from Durham in May, expect somewhat warmer with lows of 64°F in Athens. Finish your sightseeing early on the 25th (Sat) so you can travel to Naxos. You'll discover tucked-away gems like Old Town and Portara. Explore the numerous day-trip ideas around Naxos: Mykonos Town (Matoyianni Street & Little Venice). There's still lots to do: stroll through Agios Prokopios Beach, look for gifts at Apodo, see the interesting displays at Eggares Olive Press Museum, and enjoy the sand and surf at Plaka Beach. For other places to visit, more things to do, and other tourist information, refer to the Naxos trip maker website . Getting from Athens to Naxos by combination of subway and flight takes about 2.5 hours. Other options: ride a ferry; or do a combination of flight and ferry. 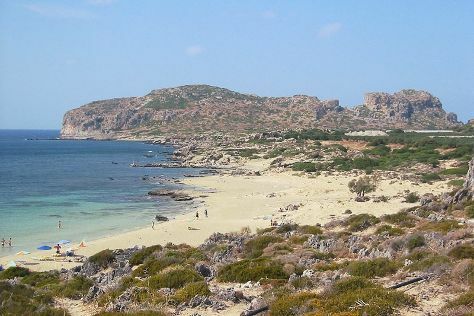 May in Naxos sees daily highs of 74°F and lows of 62°F at night. Finish up your sightseeing early on the 28th (Tue) so you can catch the ferry to Kamari. Kamari is a coastal village on the southeastern part of the Aegean island of Santorini, Greece, in the Cyclades archipelago with a population of approx. Eschew the tourist crowds and head to Hiking Trail Fira - Oia and Wine Tours & Tastings. Explore Kamari's surroundings by going to Oia (Amoudi Bay & Speed Boats Tours). There's much more to do: learn about winemaking at Santo Winery, explore the ancient world of Akrotiri, look for gifts at Oneiro Jewelry, and view the masterpieces at Eduart Gjopalaj. To find ratings, maps, photos, and other tourist information, read Kamari day trip planner . Traveling by ferry from Naxos to Kamari takes 1.5 hours. In May, plan for daily highs up to 75°F, and evening lows to 63°F. Finish your sightseeing early on the 1st (Sat) to allow enough time to travel to Hersonissos. Explore hidden gems such as Aquaworld Aquarium & Reptile Rescue Centre and Stalis Beach. 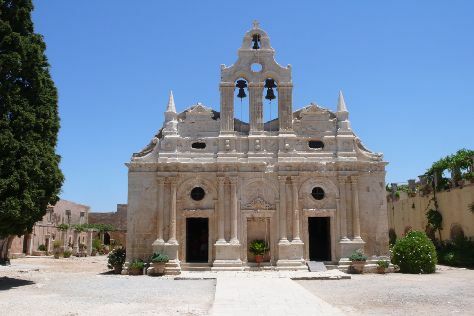 Venture out of the city with trips to Heraklion (Heraklion Archaeological Museum & Church of Saint Titus) and Agios Nikolaos (Spas & Wellness & Lake Voulismeni). The adventure continues: admire nature's wide array of creatures at Cretaquarium - Thalassocosmos, look for gifts at Luxurious Furs, contemplate the long history of The Palace of Knossos, and examine the collection at Lychnostatis Open Air Museum. To see other places to visit, ratings, photos, and more tourist information, read our Hersonissos holiday planner. Traveling by ferry from Kamari to Hersonissos takes 2.5 hours. Expect slightly colder evenings in Hersonissos when traveling from Kamari in June, with lows around 64°F. Wrap up your sightseeing on the 4th (Tue) to allow time to drive to Rethymnon. You'll explore the less-touristy side of things at Monastery of Arkadi and Scuba & Snorkeling. Venture out of the city with trips to Chania Venetian Lighthouse (in Chania Town), St. Nicholas Church (in Georgioupolis) and Lake Kournas (in Kournas). There's still lots to do: steep yourself in history at The Venetian Fortezza, stop by Olive Wood Traditional Workshop, wander the streets of Rethymnon Old Town, and soothe aching muscles at some of the top local wellness centers. To find traveler tips, more things to do, and tourist information, you can read our Rethymnon holiday planner . Traveling by car from Hersonissos to Rethymnon takes 1.5 hours. Alternatively, you can do a combination of bus and shuttle; or take a bus. In June, daily temperatures in Rethymnon can reach 84°F, while at night they dip to 67°F. Wrap up your sightseeing on the 7th (Fri) to allow time to drive to Kissamos. A quiet port town situated on Crete's western tip, Kissamos attracts mostly domestic tourists and possesses more of the quintessential Greek feel than livelier resorts strung along the island's coastline. You'll discover tucked-away gems like Falassarna Beach and Komolithi. Get out of town with these interesting Kissamos side-trips: Agia Marina Beach (in Agia Marina), Manousakis Winery (in Vatolakkos) and Psilos Volakas Beach (in Palaiochora). There's much more to do: look for gifts at Sklopa, pause for some serene contemplation at Church of St. George, and explore the different monuments and memorials at German War Cemetery. To find reviews, other places to visit, maps, and other tourist information, use the Kissamos road trip planner . Traveling by car from Rethymnon to Kissamos takes 1.5 hours. Alternatively, you can take a bus; or do a combination of bus and shuttle. In June, daytime highs in Kissamos are 84°F, while nighttime lows are 67°F. Wrap up your sightseeing on the 10th (Mon) to allow time to travel to Corfu Town. Discover out-of-the-way places like Old Fortress Corfu and The Liston. Change things up with these side-trips from Corfu Town: Mavroudis Family Museum and Modern Olive Oil Press (in Vraganiotika), Speed Boats Tours (in Kavos) and Sakis Water Sports (in Kalami). There's much more to do: contemplate the long history of Kassiopi, don't miss a visit to Spianada Square, wander the streets of Corfu Old Town, and enjoy the sand and surf at Paralia Agios Georgios. To see ratings, maps, and other tourist information, use the Corfu Town trip planner . Do a combination of shuttle and flight from Kissamos to Corfu Town in 5.5 hours. Alternatively, you can do a combination of ferry and bus; or take a bus. In June, daytime highs in Corfu Town are 85°F, while nighttime lows are 66°F. Wrap up your sightseeing by early afternoon on the 14th (Fri) to allow enough time to travel back home.